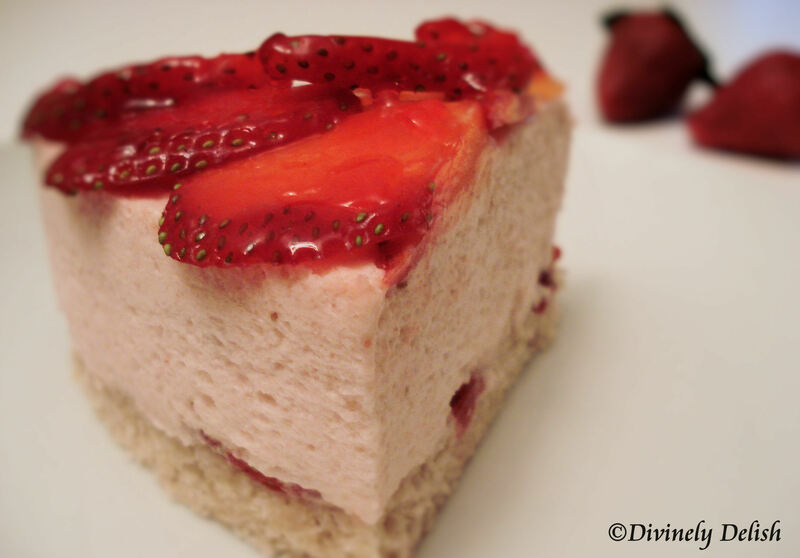 A Fraisier is a French cake, traditionally made up of two layers of an Italian sponge cake, genoise, lined with strawberry slices, filled with a creme mousseline (a pastry cream and butter cream combination), and topped off with a marzipan layer. I’d made a Fraisier before and had been wanting to make it again, so I thought here was my chance. As it turns out, this isn’t a real Fraisier. 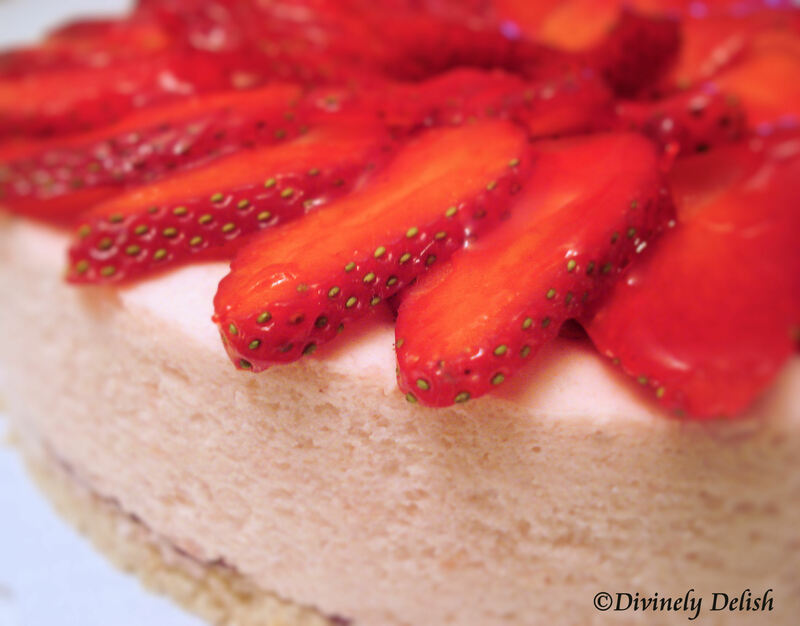 It’s basically a Strawberry Mousse Cake. But that’s ok with me because I’m a big fan of mousse – chocolate mousse, strawberry mousse, lemon mousse, mousse cakes, you name it…I love how light and airy mousse is, and the way it just melts in your mouth. And with the pink champagne, it just sounded divine. You can make individual mini cakes or, as I did, a single 7″ cake. If you have acetate cake collars, place a strip on the inside of the cake ring before assembling the cake. This will make it easier to remove the cake ring. 1) Rinse strawberries and remove stems. 2) Reserve 10-12 for garnish; place the rest in blender and process until pureed. 3) Strain through a sieve into a medium bowl. Stir in champagne. Reserve for Cake and Mousse recipes. 1) Preheat oven to 350F (180C). Line baking sheet (12″x16″/30×40 cm) with a silicone mat or parchment paper. 2) Sift together cake flour, baking powder and salt. Mix with 1/4 cup sugar. 3) In a separate bowl, whisk together oil, egg yolks and coulis. 4) Add dry ingredients to wet ingredients and mix until well-incorporated. 5) Place egg whites in a clean, dry bowl and whip. Once whites become foamy, gradually add 1/4 cup sugar. Continue beating, until stiff peaks form. 6) Fold egg whites into cake mixture in 3 additions. 7) Pour batter onto prepared baking sheet, spread a thin even layer using a large offset metal spatula. 8) Bake for 6 minutes, rotate pan and bake for another 5 minutes, until edges just begin to turn golden and cake has risen and is soft and springy to the touch. 9) Remove from oven, run a knife around edges of sheet pan to loosen cake. Carefully remove cake from sheet pan and cool completely on a wire rack. 1) Sprinkle gelatin over 4 Tbsp of cold water and let sit for 5 minutes until softened. 2) In a medium bowl, microwave Coulis to boiling. Stir in bloomed gelatin, whisking to completely dissolve. Keep whisking until cooled to room temperature. 3) Whip cream and sugar to soft peaks. 4) Fold cream into gelatin mixture in 3 additions. 1) Using small metal cake rings, cut cake into desired shape and arrange on a parchment-covered cookie sheet. 2) Place a piece of cake at bottom of each ring, layer with thinly sliced strawberries and add 4 – 5 Tbsp of Strawberry Mousse. 3) Level top with small spoon. Refrigerate for at least 3 hours. 4) Near serving time, remove cakes from refrigerator. Using the tip of a knife, scrape around tops of mousse to detach it from metal ring. Rinse a towel under hot water, wring it, wrap around each ring for a few seconds and then push cake to top. The mousse and cake should come out easily. If not, wrap the towel a little longer. 5) Add sliced strawberries on top along with a strawberry cut into a fan – make small cuts from the tip of the strawberry towards the attached stem, then press lightly on the strawberry to fan it. 6) Prepare Glaze and glaze strawberries. Refrigerate until ready to serve. In a saucepan, mix clear glaze with sugar. Stir in cold water. Bring to a boil; let boil over medium heat for 1 minute. Cool for 1 minute, then spoon glaze evenly over strawberries.